Home / Blogs / Do cows use cell phones? Do cows use cell phones? Ask some of my friends and they will tell you that I am a person that can misplace things from time to time — alright, all of my friends will tell you that. Knowing the location of my smartphone can be one such challenge. In my mind, smartphones are both a blessing and a curse. The good? Nearly the entire span of human knowledge and wisdom is available to us at the flick of a thumb on a device that fits in our pocket. The bad? The fact that the entire span of human knowledge and wisdom is on a device small enough to fit in our pocket — and then go undetected when flung unknowingly into a field. I used to work on my extended family’s large dairy farm where I had carried on the tradition that my two older brothers, whom had worked before me, began. 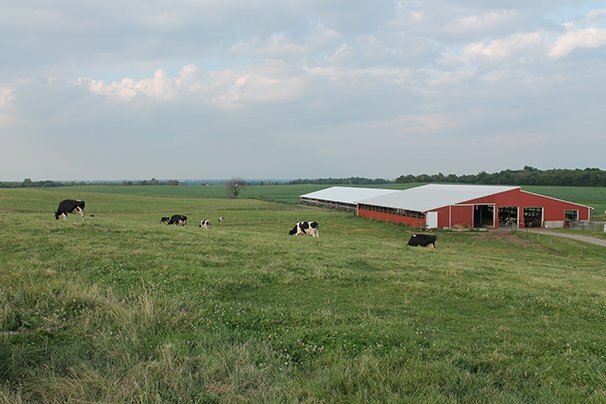 Now this dairy, like most farms of its type, gains most of its herd growth from heifers born on the operation. It takes roughly two years for a newborn calf to become ready for the milk cycle, and during the summers of their development, many of them are put out to pasture. One of my jobs at the farm was to buddy up with my cousin on the weekends — let’s call him J — to feed grain to pasture heifers in order to better manage their diets. To this day, it was one of my favorite jobs. A lot of the world’s problems were solved in the cab of that truck driving from pasture to pasture in the early hours each day. One morning, however, the world’s problems had to wait. There we were, headed back to the last pasture of the day. J was driving and I was on gate duty (at any moment ready to leap out of the truck and open the gates keeping the truck out and the heifers in). He nonchalantly asked if I had gotten a message from my uncle, the boss man. I quickly swiped my hand into the right front pocket of my iodine-stained jeans. I quickly rummaged the left front and back pockets of my jeans before realizing my device was nowhere in the denim. With wide eyes and adrenaline pumping, I immediately lunged out of my seat and turned around. My cousin, startled at the sudden movement, swerved across the road, sending my head into the glass window, making a “konk” sound in the process — similar to two coconuts being smashed together. The mild concussion-inducing head bounce only delayed the realization for a few seconds — my phone was not in this vehicle. “Well did you leave it at the farm?” my cousin offered. “No! I had it after we left because I looked at the time as we were on the road!” I frantically recalled. There, somewhere in the five pastures we had visited since that time, the phone was likely laying. Helpless, cold, alone — my smartphone was maybe feeling the tickle of a cow’s rough tongue, or even the indelicate harassment by a heifer’s hooves. The latter was unthinkable. I couldn’t stand to imagine the prized object in such an abysmal situation. Ok yes, the phone was just a mangling of metal, glass, and electricity that could be easily replaced, but no such thoughts crossed my mind in that moment. We had to find it. My cousin, through a bond we had grown in our long pasture mornings together, immediately absorbed my panic and alarm. The gas pedal hit the floor, tires squealed, and the local church bells seemed to echo in alarm as we were off to find the phone. We started by heading to our prior stop — a barn with a pasture that ran back to a creek to an adjoining field on the other side of the road. To our dismay, another member of the farm was just arriving in front of us, dumping a load of gravel near the bunk in which we had stopped to deliver feed. Surely my phone was crushed by the tons of vehicle and rock above it if it had been there. Pasture after pasture heard our panicked calls, but still nothing. Then, an idea — the smartphone I lost was an iPhone! It had been equipped with the “Find My iPhone” feature when I originally bought it and could still be found if it had not yet met its demise at the hands of heifers or herdsmen. The location app was available with any other smartphone. My cousin, however, was still clinging to a flip phone at the time, and like many farmers, was holding out on getting a smartphone for some secret, unknown reason which only they seem to know. Our means of accessing the location feature wasn’t possible. Good news broke as we realized his tech-savvy wife did have a smartphone. A quick call was placed urgently explaining the situation and what she had to do. My cousin soon received a picture from his wife to his phone. It was a screenshot of a satellite view map that had a blue dot that had the words “Joel’s iPhone” emboldened above it. We went straight to work deciphering the landmarks and geography from the aerial view picture, an interpreting job that even the U.S. Army would envy. We cleverly deduced it was back in the pasture where we had first looked, the same place the gravel was being unloaded. We proceeded that way with doubts about the accuracy of such GPS technology as the blue dot showed us it was in a part of the field we had not been. Our arrival back to the field was greeted with the harsh realization that the little blue dot on the map coincided very closely with the placement of two large piles of gravel. When I say very well I mean in the exact same dang place. My cousin immediately started calling it from the truck parked afar in order to keep from unwittingly crunching the device. I started scanning the ground near the feed bunks where we were, hoping the accuracy of the little blue dot was off by several feet (possibly, we thought, due to several shiny grain bins and tin roofs nearby bouncing the signal around — NASA scientists we are not). The minutes passed and the search path kept getting wider and wider. My cousin kept calling the phone, interrupting the deadly silence that we had maintained with a loud shriek from time to time exclaiming, “THE PHONE MUST STILL BE GOOD BECAUSE IT KEEPS RINGING.” Thanks for the hope, J. After a notable amount of time went by, we decided to reevaluate the situation. Should we abort, give up, and head back to the farm to continue with the morning’s chores? Or try once more? Another look at the tiny map on the itty bitty flip phone screen and we decided to go closer to those foreboding gravel piles that would mean sure death for a smartphone. J went back to calling and I intrepidly headed out to the middle of the field, a location where we hadn’t been all morning. Why would the phone be there? My ears twitched at the slightest sound as we maintained strict silence in the search for the ringtone (albeit the occasional assurance scream of “IT’S STILL RINGING” by J — thanks again for the hope, cousin). And then…something — was it a trick my ears were playing on me? Was it a cow mooing in a far off pasture? Was it a fly passing by? Was it a groundhog moving underground? No, this was the distinct sound of on and off vibration made by a phone. I ran towards the origin of the audio about 15 feet away. There I saw a black object glint in the sunlight and I hurriedly dove ahead for it, screaming in the process. My phone had been found! I hoisted it into the air with a victory yell. J was rocking the truck in celebration of the find. I ran towards the vehicle with urgency, jumping and waving my phone in excitement while doing so. The culprit for the phone’s missing? We figured the clumsy placement of it halfway in my pocket. The reason for the phone being in the middle of the field? Well, a telltale sign after its discovery helped us with that — a healthy dose of cow cud covering the phone from top to bottom. It seems one of our bovine friends had decided it was time their herd had access to the entire span of human knowledge and wisdom, but it looks like they grew tired of that and went back to the excitement of eating grass. Maybe they’re onto something? Good moooove cows, good move.